Moving day finally arrived on June 22nd, 2005. After a flurry of packing and final push to make the house livable (there was no running water as of 6/20/05), we were in. The next two weeks continued to feature an array of craftsmen finishing odds and ends around the house, much to the surprise and dare I say dismay of our exchange student, Carlota. After the boxes were unpacked (actually, I confess, a few still aren’t unpacked, but I’m gaining on it – I even found my fondue forks) we started in on some of the many projects we had opted to finish ourselves, including the deck. 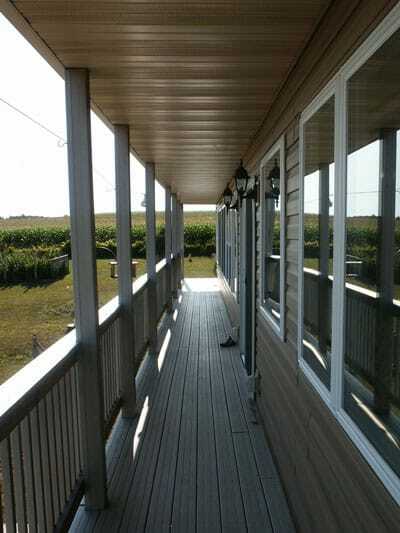 As I mentioned in a previous article, the deck is a long narrow strip that runs the entire length of the south side of the house. It then functions as an overhang for the basement windows to prevent excess solar gain and overheating. Online software to help you model overhang shading can be found at Sustainable by Design. There is no large seating/gathering area on the deck, because such an area would cause too much shading in the basement. An entertainment area is provided on the concrete patio below. Access to the deck is provided via the main patio doors and stairways at the east and west ends of the house. This proved to be somewhat problematic. 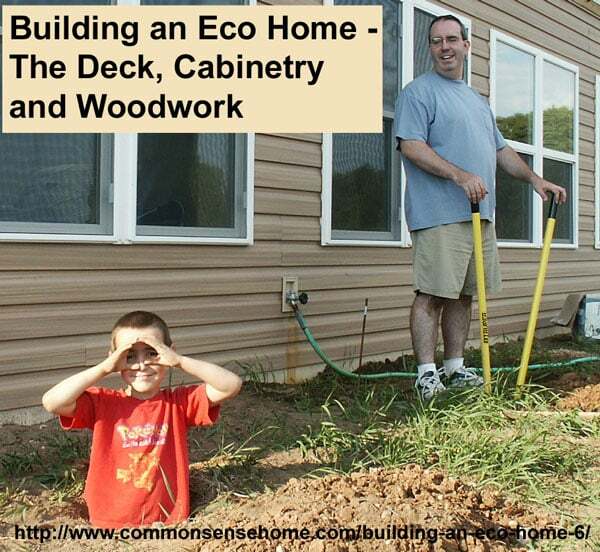 No matter where we put steps that would make the ground level patio easily accessible, they would shade some part of the basement or attached greenhouse. In the end, we decided to run the east stairway perpendicular to the house at the corner of the home. There will be a walkway from the front of the home over part of the greenhouse connecting to the deck. This walkway will also lead to the stairs, so we or our visitors can walk directly and easily down to the rear of the home from the elevated entrance. Unfortunately, this means that the attached greenhouse now only gets morning sun, which reduces its functionality. Part of the greenhouse will be almost completely shaded (right next to the house where the walkway goes over the top). This area will be used for storing gardening/planting supplies (all those little cell packs and other containers I use for seed starting now have a home). Speaking of composite materials, the cabinets are in and they look great and function even better. Paul Yeager and the crew at Cosmic Walker cabinetry can be proud of a job well done. We decided to use sustainably harvested hickory for the face frames coated with a clear finish. 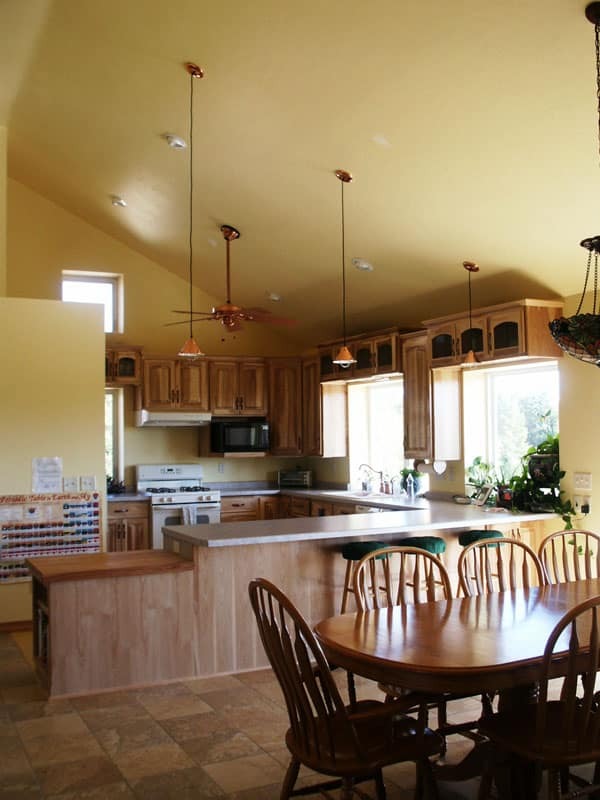 The balance of the cabinets is wheat board, which is composite material made out of compressed wheat straw. Paul also worked with us to design the closets in the house, which he and August laid out in Paul’s new design program. The crew at Cosmic Walker supplied the parts and we installed them ourselves. All of the closet shelving is made out of wheat board, like the cabinets. As the house evolved, we made changes in our wood choices. We started out planning for the typical “light oak” finish on all the woodwork, but Paul prefers to avoid the use of stains to minimize environmental impact of his cabinetry. What we ended up with is an unusual mix of woods. There are hickory cabinets, oak stairs, maple trim, pine doors, fir doors (recycled from August’s great Uncle’s house), pine railings for the boys loft, natural strand woven bamboo, cork floors, pine bead board on the front porch and light oak furniture. The only pieces that have been stained are the furniture, everything else is just varnished, which has created a unique look for the home. August was a little nervous about leaving the woods unstained, thinking that it would look unfinished or odd. I talked to Paul about this via email, and here’s what he had to say on the subject. “The various species represent the blend of a number of similar paths. This house your family is building is made up of so much more than “bricks & mortar”. The use of mostly “old world” woods with a bit of new philosophy (bamboo) shows a heritage with a future. The antiques honor the past & ancestors. The metals used are traditional with ancient roots. I thought this was beautiful, and it has turned out to be true. The wood positively glows, and the house has a warmth and charm, a character not seen in every home. As we continue the finish work and additional decorating (I’ve always wanted to do a mock “cave painting” in an out of the way nook), the house will grow and evolve with us. We are truly home. Reading this article gives an urge for me to read all other parts of this article series. As a pro-environment individual, I like the insights integrated in this article about building an eco home.